Presentation of the Starfield Award. (Left to right) Professor Jonathan Weiner, executive director of research and ACG System Co-developer; Sangeeta Saran, associate director of Planned Care at East Berkshire CCG; Kumar Subramaniam, executive officer for Population Health Analytics at Johns Hopkins HealthCare Solutions. 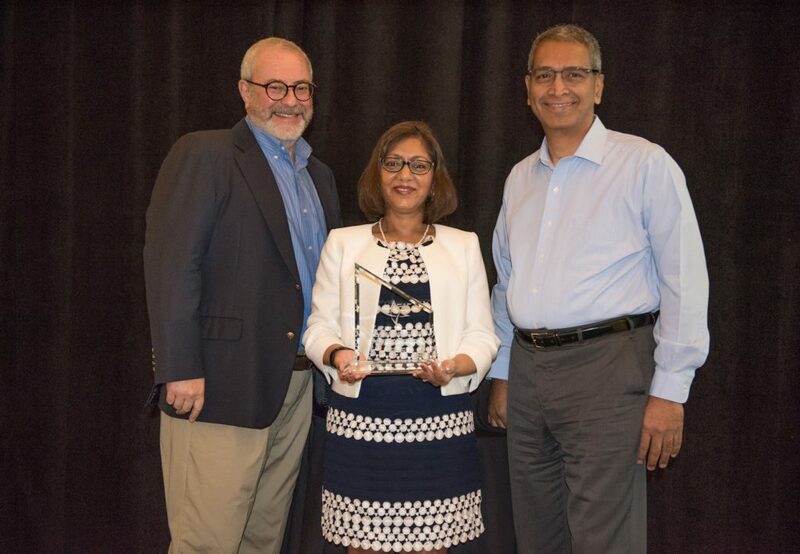 NHS East Berkshire Clinical Commissioning Group (formerly the Slough Clinical Commissioning Group), located in Great Britain, won this year’s Starfield Award for their project entitled “Population Profiling to Support a New Model of Clinical Delivery.” The award was announced at the Johns Hopkins ACG System’s 2018 International Conference, held in San Antonio, Texas. The Johns Hopkins ACG System analyzes health care data, the results of which improve accuracy and fairness in evaluating provider performance, identifies patients at high risk, forecasts health care utilization and sets equitable payment rates. It has been used in commercial, government and research settings worldwide, longer and more extensively than any other health care data analytics system, impacting close to 200 million lives in 30 countries. The NHS East Berkshire project used the ACG System to identify people at risk of hospital admission and then provide them with a care and support plan. Their impressive analytical work resulted in the creation of a new type of care program that is delivered within a primary care setting. The Starfield Award, established in honor of Barbara Starfield, M.D., a Johns Hopkins University Distinguished Professor and co-developer of the Johns Hopkins ACG System, honors her legacy by recognizing the best use of the ACG System in three key areas of her work: addressing multi-morbidity in individual patients and populations; reducing disparities in the delivery of primary health care; and improving population health. “We congratulate the team for successfully converting ACG System data output into actionable information and then using it to inform their population health management approach,” said Kumar Subramaniam, executive director of population health analytics at Johns Hopkins HealthCare Solutions. Find out more about Barbara Starfield and the Starfield Award. For more information about the Johns Hopkins ACG System, visit HopkinsACG.org. To learn more about Johns Hopkins Population Health Analytics, click here.